Stirring news out of Canada – one of the lost ships of the doomed Franklin expedition has been found! On May 19, 1845 Captain Sir John Franklin left Greenhithe, England, with two ships, the Erebus and Terror, and a crew of 24 officers and 110 men. They sailed into the teeth of the Arctic seeking the fabled Northwest Passage, ‘iron men in wooden ships’. 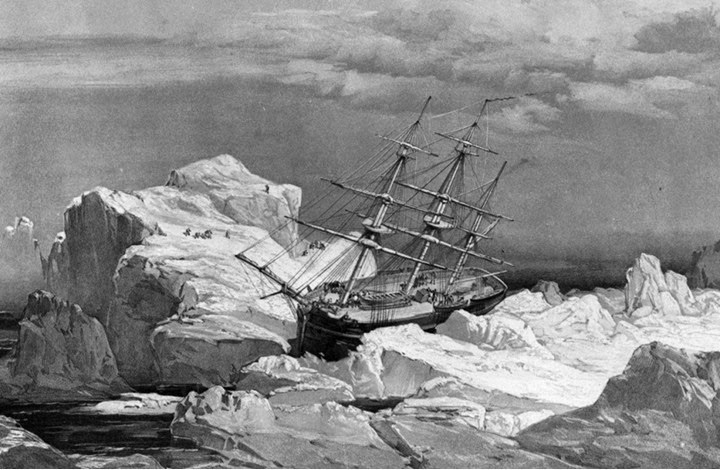 Why does the Franklin expedition haunt Canadians so? In my view, Canada’s core myth or story is the fight for survival in harsh, inhospitable circumstances. Canadians tend to be dour, tough, and reserved, even in summer. We know that before long, our gorgeous landscapes will be covered in ice and scored by artic wind. We’re at our best when the odds are long, and we never give up. I think of the fighters that took Vimy Ridge in 1917, or Juno beach during D-Day, or the indomitable hockey teams that over the years have repeatedly mounted improbable comeback victories. The Franklin expedition touches Canadians at a very deep level. Heroism against impossible odds, fortitude in the world’s harshest climate, teamwork and commitment to a better future – these are Canada at its best. Stan Rogers song movingly expresses these ideas. Even in the face of an awful, lonely death, Franklin is still fighting, still reaching for the Beaufort Sea and the Northwest Passage. The Northwest Passage, for Canadians and many others, represents a better place, a shining city, where life will be easier and our children may prosper. Was this not the dream of the immigrants who built this great land over the past four hundred years? We don’t know which of the ships has been found, nor what treasures and secrets it will yield. But Franklin and his men have been found and are back with us again, where they belong.